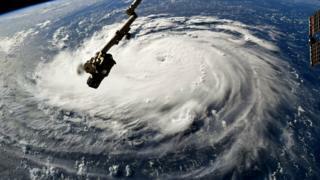 Hurricane Florence has arrived on the eastern seaboard of the United States. So why do we call one a hurricane and the other a typhoon? And while we're at it - what exactly is a cyclone? "Once a tropical cyclone reaches maximum sustained winds of 74mph (119km/h) or higher, it is then classified as a hurricane, typhoon, or tropical cyclone, depending upon where the storm originates in the world." And in the South Pacific, it's cyclone season between November and April. "Eight countries in our region, which covers the Bay of Bengal and the Arabian Sea, sent the list to the WMO during the early 2000s," a senior scientist with the Indian Meteorological Department told the BBC. "Nearly 50% of those names for cyclones have been exhausted. "The agreement between the countries in our region then was to make sure that the names do not hurt religious sentiment in our countries." Over land the strong winds can cause a lot of damage - they can flatten homes, knock over trees and even tip over cars. Image caption Mangkhut is forecast to strike northern part of Philippines on 14 September.